You love your kids, but you don’t love the little messes they leave in their wake. Sippy cups dribble fruit punch on your tan carpet, and that candy in your daughter’s pants just left a nasty stain on her bedroom floor. You’re committed to teaching them to keep food in the dining room, but you also need to address the food stains. Whether the stains are the result of your own carelessness or children who forget the rules, you can use these tips to address the problem and overcome the stains. Whether it’s chocolate or spaghetti, you want to start with the chunks of food. This is where having a dog that can eat table scraps comes in handy, but a paper towel will also work. Pick up the larger pieces, and sweep the smaller crumbs towards the center. Use a damp sponge to sweep it over the surface and collect the final little crumbs. With the food gone and the stain exposed, you’re ready for the next step. Using a damp sponge, gently wipe at the stain. Move from the outside of the stain to the interior to avoid spreading it around the room. The stain should gradually lighten as you pull up more food or drink. However, you will be left with a simple stain at some point. In the past, this might have been the point where you would throw up your hands in defeat and make a commitment to buy new carpet when the kids go to college. However, you don’t have to live with the stain. Most food stains can be removed with simple vinegar. Dilute the vinegar with warm water and spray the solution directly onto the food stain. Let it sit for a few minutes, and then use a cloth to start blotting up the vinegar solution along with the stain. Continue blotting at the stain until you stop pulling up moisture and discoloration. If the stain persists, then it’s time to pull out a more serious cleaner. Make a paste of baking soda and water. Rub this into the stain and wait about 20 minutes. Wash it out with a damp cloth to remove the stain. After it dries completely, you can vacuum up the residual baking soda. If the baking soda doesn’t work, then you can also try using club soda, or you can make a solution of dishwashing detergent and water to scrub out the stain. Food stains can happen to even the most diligent families. Whether you’re constantly battling falling food or you only have a few stains, they can become an eyesore. 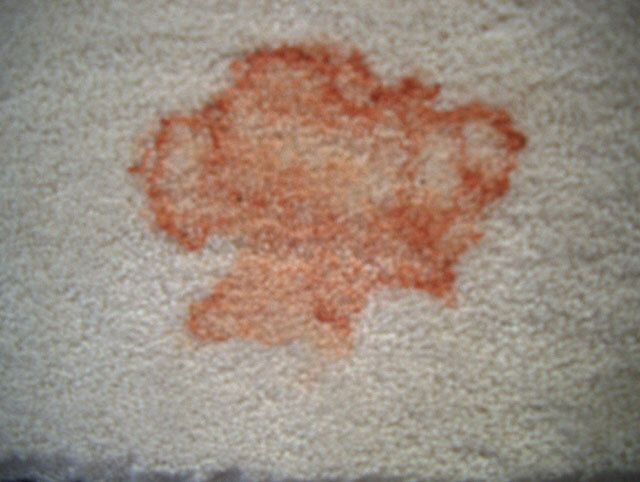 If you don’t want to spend your day hunched over to treat a stain, then consider calling in the professionals. Our teams at High Quality Carpet have access to powerful stain removers and state-of-the-art equipment. In addition to removing fresh stains, we can also minimize older stains to make your carpet clean and attractive again. Whether you have one mark to address or a few dozen, you can call us for assistance.